I suppose I deserve this one. Some years ago on the blog, I wrote about my days in grad school having to learn about symmetries and vibrational spectroscopy. Sparingly has that knowledge come in handy since then, but the course is still a vivid memory for me, since that’s the clearest example I had yet faced in a classroom of having hit the limits of what I knew. I’d never been exposed to symmetry operations before, so the lecture that morning might as well have been in Basque for all I could make out of it, and that had never quite happened to me up until that point. And looked up in surprise. And couldn’t say its name. And symmetries of normal modes. Well, this new paper, amazingly enough, details a technique that lets one observe just those normal vibrational modes on a single molecule, in bizarrely high resolution. And I saw “bizarrely” because it actually works much better than it should (and I’m sure far better than the authors were expecting! ), providing both interesting data and an interesting theoretical problem on top of the observations. This is an application of Raman spectroscopy, specifically surface-enhanced Raman spectroscopy (SERS). Typical Raman work involves shining a laser beam through (or off) a sample and looking for small shifts in the original light’s wavelength due to inelastic scattering – some of the photons scattered have slightly lower energies, having lost some by exciting vibrational modes in the sample molecules. This effect can be hugely enhanced (by factors of billions) when the molecule(s) involves are sitting on a metal surface, and that’s how SERS got started. I am no expert in the field, but it’s my impression that the exact theory behind the effect is still being debated – what’s for sure, though, is that it has to do with the interaction between visible light and metallic nanostructures (typically gold or silver), and that the effect is at its peak at certain “hot spots” on the metal surface. You can bring a metal tip down to a single surface-adsorbed molecule and get the effect that way, which is TERS, tip-enhanced Raman spectroscopy. (Here’s a Nature News and View piece on the new paper that goes into some background on all this as well). This latest work (from UC Irvine) shows a cobalt-tetraphenylporphyrin molecule on a copper surface, cooled to cryogenic temperatures and scanned by a silver probe tip under laser illumination. The setup is crucial – for example, if the molecule is sitting on a gold surface, it literally slips away as the silver metal tip gets close enough, apparently because of a different charge balance on its cobalt atom. On copper, for reasons that also need to be worked out more, it’s much more tied down. As for the readout from the experiment, things change completely as you get very close indeed to the surface – the data at a three-angstrom distance are totally different from those recorded at a two-angstrom separation. Tunneling kicks in, and the resulting data show extremely high spatial resolution, to the point that you can actually reconstruct the normal vibrational modes of the single molecule. Shown are the experimental data (top row), simulation (middle) and the assigned vibrational modes themselves at bottom. This is pretty startling – there they are, the stretching, wagging, bending, and waving motions that you learn about when you study vibrational spectroscopy, actual chemical bonds behaving like little springs, exactly as the textbook says. But exactly how this resolution is achieved will be something to work out, because the usual theoretical underpinnings of SERS break down on this small a scale. This technique has gone Full Quantum Mechanics, down there in the “atomistic near field”, and the authors go as far as they can before remarking that “In this atomistic limit, the rich physics of plasmonic junctions is more naturally explained in terms of cavity-confined charge densities and currents, which must be included for a more complete treatment in the tunnelling limit.” But that more complete treatment isn’t here yet, and working it out will keep some folks occupied for a bit, you’d think. “Rich physics” is sort of the tipoff phrase, a synonym for “#@$%! complicated”. But somewhere in there are enhancements of 1012 over what any less comprehensive theory would tell you could be seen. And that’s what’s letting us see this. . . When I was working towards a third major in Chemistry to go with the Math and English majors I already had pinned down in the late 80s I did some senior level special projects one summer that involved synthesizing and then characterizing some fluoro-beryllates for one of the professors. Part of this involved doing Raman spectroscopy. I thought the basic process was close to magic but what these researchers have done truly seems to go beyond magic. No supporting info apart from raw data. “All data needed are within the paper”. *How many replicates did they do? * I mean, this is a big claim. They just did it on one porphyrin? Translation: There’s a lot of calculating between the data and the pictures. Simulations of unknown accuracy are also involved. The first row displays direct plots of raw data. The second row shows simulated images, so of course calculations are involved. The details of simulations are explained in Methods section, and calculated polarizability differences are specified in atomic units if you look at extended data figures. JL — Yes the pictures are gorgeous and calculations are involved. I hope this won’t turn out the way many papers on functional cerebral MRI, did producing reams of pretty pictures which always showed the results the authors were looking for. Eventually it came to called pseudocolor phrenology. The pictures were gorgeous and calculations (never shown) were involved. There are an infinite number of ways to invert the matrices involved to get the desired result. The whole field headed south for a while after it was discovered that thousands of papers were written without checking whether the subjects were asleep — honest to God. 70% of them were asleep during part of the recordings. Luyssi, one of my favorite lines is that fMRI is nothing but technicholor phrenology. Does not win me too many fans among the imaging folks here, but I have more neuroscience training than they do. Physics’ past 40 years trying to merge quantum mechanics with relativity suffer 100% empirically sterile theory. Chemistry handwaves heuristics, then “look at this!” A hamburger in hand is so much more satisfying than an imagined perfect steak. The hamburger can be optimized. Never go Full Quantum Mechanics! Reading Richard Rhodes’ Pulitzer-winning history The Making of the Atomic Bomb while also reading this. I just happened to be at the page where, reflecting on Hans Geiger and Ernest Marsden’s experiment in which alpha particles were deflected 90 degrees or more by a gold foil, Rutherford reached the conclusion that an atomic nucleus was responsible for that counter-intuitive result, the alpha particles whipsawing around the gold nuclei like comets around the sun. The realization took Rutherford a year of pondering and mental reflection – he was naturally concerned not to casually announce that Lord Kelvin’s and J.J. Thomson’s postulated models of how atoms are arranged were fundamentally wrong. I’m struck by the similarities and the differences here. The characterization of the effects the paper’s authors observe as “rich physics” is an understatement. One wishes they’d made the physics a bit less obscure by taking the time to explore its implications more fully. Priority’s a great thing to have, but mentioning the simulations almost in passing without documenting them more fully cost the paper some plausibility. 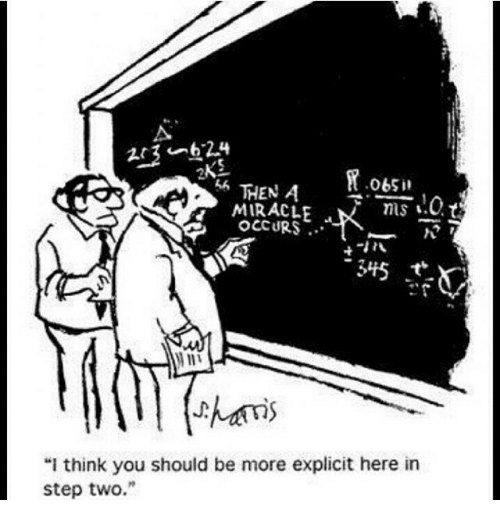 Sidney Harris’s classic cartoon, “and then a miracle occurs” comes to mind, too. The near field is poorly understood. Anyone familiar with the ARRL antenna design book, a must have for any serious EE, knows that EM waves behave weirdly when you are down near their wavelength. It’s all mysterious. For example, why can you call your cell phone when it inside a closed, unpowered microwave oven? (Don’t try this with the microwave oven running.) No one knows. This technique takes one into the same area, except the wavelengths are a lot shorter. I suppose that makes it all even more amazing and unbelievable. These models do come with something of a warning. It is difficult to know what either the charge state or the spin state of the tetraphenylporphyrin actually is in “flattened” mode on the copper surface since I could not find these properties stated in the article itself. So I have computed the normal modes for the system with charge +1, 0, -1 and for spin states singlet, doublet, triplet or quartet.